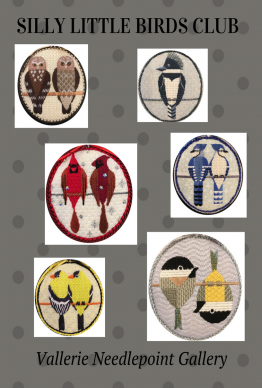 Vallerie Needlepoint Gallery and Scott Partridge have combined their artistic talents to create a series of six Silly Little Birds. The designs include Owls, Kingfisher, Cardinals, Blue Jays, Finches, and Chickadees. Each Canvas includes a Stitch Guide. We will supply the required threads and beads for an additional fee. 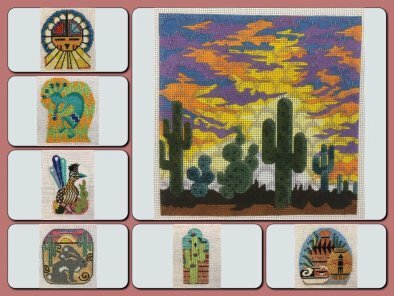 Our Southwest Club features seven exclusive designs by Julie Mar & Friends: Sun Face Kachina, Kokopelli, Roadrunner, Jackrabbit, Cactus, Pottery, and Landscape. 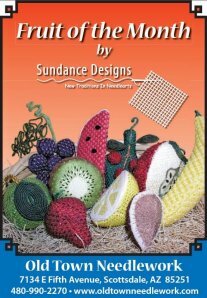 Each canvas includes a stitch guide by Nancy Yeldell and all the fibers required. You may also participate without purchasing the fibers. into the shop to see the models. They are fabulous and quick to stitch! Join any time our Micro Mini-sock club designed by Associated Talents. The club consists of 8 designs each with a stitch guide and fiber packet. There are many more designs available. Once you stitch one, you'll be hooked! 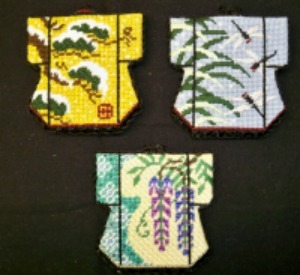 Each month you'll receive a painted Kimono Canvas, Stitch Guide, Threads and Beads. Past clubs may be joined at any time. 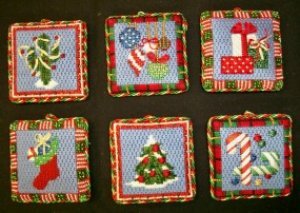 They include Kathy Schenkel's 12 Days of Christmas, Ruth Chow's Fruit of the Month, Stitch-Its' Angels. You may join any club at any time throughout the year.